The 2nd year postgraduate student in biology Alexander Fomichev worked in Tigireksky Nature Reserve during the period of 31 December 2016 to 7 January 2017. The trip was aimed at visiting different regions of this territory in unusual seasons, penetrating into Yashchur Cave and make amateur observations on wild animals. Alexander Fomichev went along the walking route through Inya River Valley and Tigiretsky Range. He also explored Yashchur Cave together with one of the reserve’s inspectors. The main objective of the visit was searching for spelean arthropods (animals living in caves). Yashchur Cave is 404 m long and 69 m deep. The place is popular with sportsmen and speleologists. The cave has a number of obstacles inside: steep slopes, deep vertical wells and crawlways. Yashchur excels the majority of Altai caves at the number of rock formations or speleothems (stalagmites, stalactites, stalagnates, rimstones, etc.). The scientist carried out the search of arthropods in the deepest part of the cave, which is quite warm and humid. Unfortunately, the search was not crowned with success. 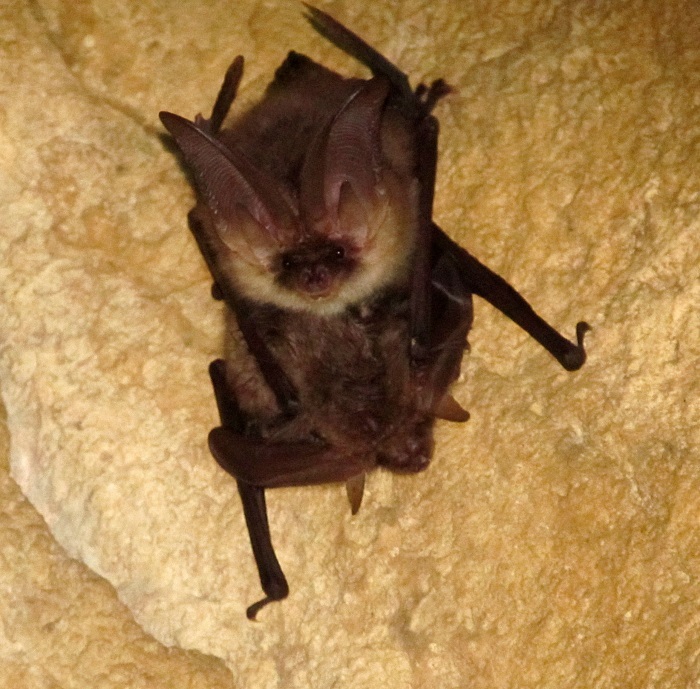 The only animals A. Fomichev managed to meet in the cave were bats: long-eared bats (Plecotus ognevi Kishida, 1927) and mouse-eared bats (Myotis sp.). Interestingly, the long-eared bats were discovered in the upper, colder, drier part of the cave at a depth of about 20 meters, while the mouse-eared bats were found in the deeper, warmer and more humid parts at a depth from 30 to 60–70 meters. Photographic conditions in the cave were rough, so there are only few pictures of the cave’s deepest, most beautiful and hard-to-reach part. Exploring the cave, Alexander Fomichev made a lot of photos depicting its structural styles. The biologist mainly paid his attention to the deepest part. Some photos show the chiropterans inhabiting Yashchur. Hiking in the mountains, the scientist found different representatives of fauna. There were especially many birds and such hoofed mammals as roe deer and red deer that could be observed very closely. Unfortunately, the weather conditions during Alexander’s trip were unfavourable. Thaw (the temperature was above zero for a long time) and abundant precipitations resulted in snow-melting and breakup of ice in rivers. Such weather combined with strong wind, the flow of which could easily knock a person down, made hiking more difficult. Despite all these complications, the winter trip turned out extremely interesting and productive and expanded scientist’s expedition experience. Alexander Fomichev expressed his gratitude to Director of Tigireksky Nature Reserve Pavel V. Golyakov, employee of the reserve Tatiana M. Krugova and reserve’s inspectors for the opportunity to visit the place and for the support provided.